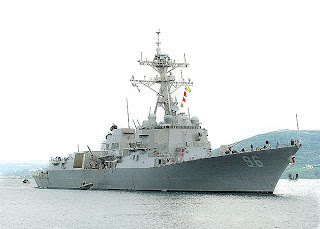 The article below is about the Norfolk, Virginia-based guided missle destroyer Bainbridge. This vessel has been leading the United States' anti-piracy mission in the Indian Ocean. Points to take note of are that this task force has only been active since January of this year and that U.S. Navy officers are only beginning to better understand pirate operations. This is interesting because piracy is not new phenomena. For covering more than 1.1 million square miles of sea, Navy sailors have gotten a surprising amount of face time with Somali pirates. Since the Navy created an anti-piracy task force in January, pirates have attacked 58 ships off the Somali coast, with 17 successful captures, according to the Navy. In several cases, Navy ships from various nations have thwarted the attacks. U.S. Navy officers who have recently returned from the region say the Navy is beginning to better understand pirate operations. Capt. Mark Young, executive officer of the cruiser Vella Gulf, said the U.S. officials learned a great deal during negotiations with Somalis for the release of the Ukrainian ship Faina. The Norfolk-based cruiser, which returned in March, captured 16 suspected pirates during its deployment. "They are highly motivated and, to a certain extent, desperate people," said Young, who will assume command of the Vella Gulf later this month. The pirates are supported by a major network back in Somalia, he said. They have access to the Internet on shore and know where merchant ships are most likely to transit. They also have the advantage of being "a very, very small target in a very, very large area," he said. Ensign Carrie Muller, boarding officer on the amphibious ship San Antonio, led more than a dozen boarding parties during two months in the task force. The San Antonio's seizure of several explosives aboard a cargo ship was a high point of the deployment, she said. It gave the sailors valuable experience and led to more volunteers for the boarding teams, she said. Sailors also had to learn how to distinguish between legitimate fishing vessels and attackers, said Lt. j.g. Rich Laraway, boarding officer on the Vella Gulf. "It's a patience game," he said.